Happy Saturday! It’s the weekend before Valentine’s Day and that means my mind is on one thing- chocolate! 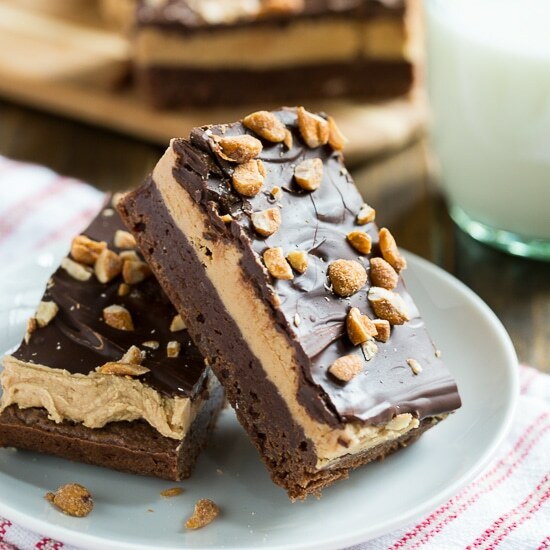 And nothing goes better with chocolate than peanut butter so I whipped up these Triple Layer Chocolate Peanut Butter Bars which I’m sharing on my friend Lindsey’s blog, American Heritage Cooking. Lindsey lives in Atlanta but just started an exciting new chapter of her life, pastry school in New York City! Can you imagine how much fun drowning in sugar and sweets everyday must be? Lindsey already makes the most amazing desserts, especially cupcakes. We’re talking Sweet Potato Casserole Cupcakes with Homemade Marshmallow Cream and Pumpkin Pecan Pie Cupcakes with Bourbon Brown Sugar Cream Cheese Frosting. They are my kind of cupcakes and I keep hoping Lindsey will open a cupcake shop and hire me as quality control. And Lindsey’s blog is not only sweets. She has totally scrumptious main dish recipes too including lighter fair like Baked Mushroom Pork Chops. Oh how I love a pork chop! Especially with mushrooms. But we better move on to the bars for a minute. 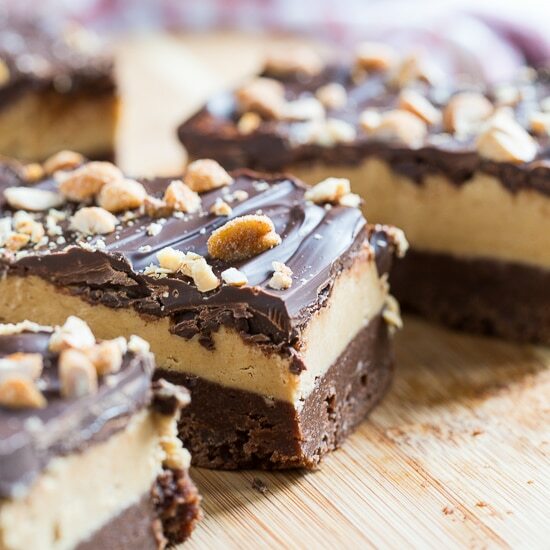 They are perfect for the chocolate-peanut butter lover. 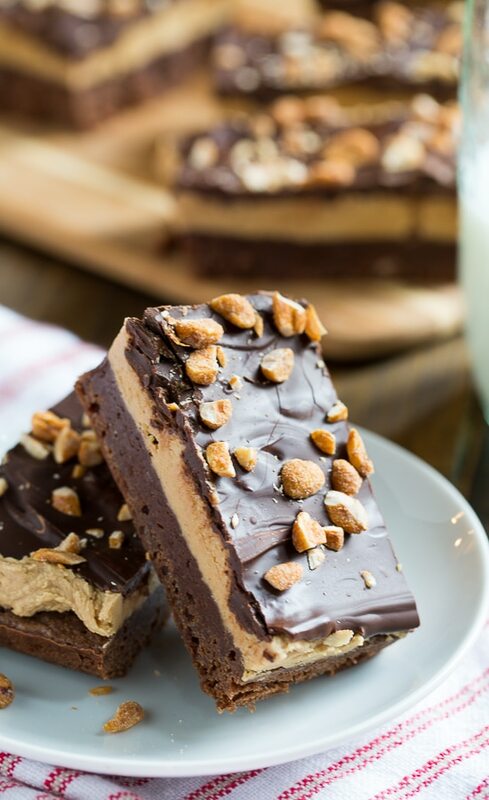 A peanut butter layer is sandwiched between a fudgy brownie layer and a chocolate topping . It’s like a chocolate and peanut butter sandwich! You’re going to have a hard time eating just one, even if you cut them really big. They are chocolate and peanut butter heaven and will have you swooning. Head over to American Heritage Cooking for the recipe and check out Lindsey’s recipes while you are there. Her writing is intelligent and humorous and really shows her personality. And her recipes can definitely add some sweetness to your life! This entry was posted in Brownies and Bars and tagged bars, chocolate, Peanut butter. Bookmark the permalink. Ok, so I made the recipe followed it exactly … but the lower layer didn’t turn out 🙁 It came out more like a cake and looks nothing like the picture. Has anyone made it and have any recommendations? Please help? Click on the link for American Heritage Cooking. These look so good! I can never resist chocolate and peanut butter- yum! Wicked! Cannot wait to make these scrumptious bars, Christin. Nothing says LOVE like chocolate–especially when paired with peanut butter. 🙂 Thanks for guesting over at Lindsey’s blog. I’m so glad to have learned about yours. Have a great Valentine’s Day week! I haven’t made a really chocolate-y dessert in far far too long. These look completely fantastic! Hope you had a great weekend!! I’m in love with these bars! Triple the chocolate, tripe the fun, especially with PB added in! These look insanely good! You made my Sunday morning, Christin! Wow!! These bars are insane in a great way! Totally a chocolate and peanut butter lover’s dream! They look amazing! 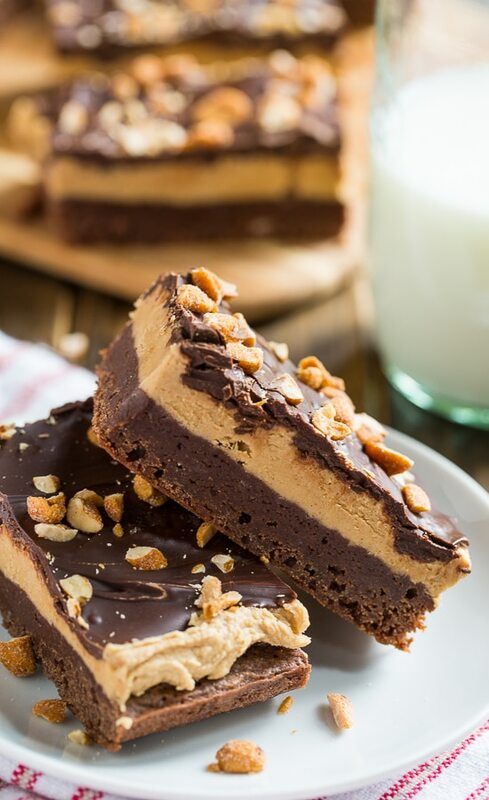 These bars are definitely made for peanut butter lovers everywhere! Love the creamy layer with the chocolate. Sounds delicious! Heading over to check out the recipe!